Blue Devils volunteer Sonja Williams, "There is so much genuine love to give and to get." Name, hometown: Sonja Williams, Concord, Calif. Which corps do you volunteer with? Blue Devils How did you get started volunteering with that corps? Daughter, Deana, was accepted into the Blue Devil A corps color guard the latter part of 1980 for the 1981 competition season (and I made the comment: "Is there any way I can help?") How long have you been volunteering? Since the latter part of 1980! 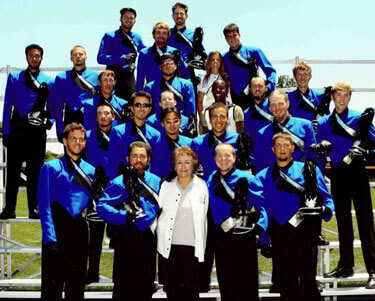 Sonja Williams with members of the Blue Devils. What kind of work do you do with the corps? For many years I was responsible for the clerical work, involved with the corps and parents, compiled the annual yearbook, took care of the corps uniforms, cooking for camps, housing, served as one of the "bus corps moms," arranged for mail stops while the corps was on tour, arranged the "Blue Devils After-Finals Brunch" held the morning after DCI finals, supplied the ageout flowers for DCI Finals, assisted Pete Emmons with the annual award banquet (facility arrangements, decorations, ageout plaques, etc. ), served as Secretary to the Blue Devils Booster Club ("Devil's Pride") and helped with all the Booster Club functions (Breakfast at Mars, Corps BBQs, "Property of Blue Devils" T-shirts provided by our Booster Club, and various Booster Club fundraisers). We used to say (excluding administrative functions) at some point in time I have been involved with almost everything connected with the corps members except teaching and driving a vehicle. Thank goodness for Booster Club members' help on many of these projects. With having my available time reduced, I am now mostly involved with all the Booster Club activities (now serving as secretary/treasurer), setting up mail stops while the Corps is on tour, providing the ageout flowers for finals retreat, arranging the "After-Finals Brunch," helping Pete with the annual awards banquet, cooking for camps, housing and transportation, acting as bus mom when possible and helping in any capacity where Pete Emmons says he needs help. What is your favorite part of being a volunteer? Without question, being involved with the corps members as closely as I am. I am currently one of the people housing members and am the "proprietor" of what is known as "Hotel Williams" due to the large number of corps members who stay at my home each year. Some stay for a short time and some stay for an extended length of time. One year there were more than 65 people who stayed with me for varying lengths of time (including friends and members of other corps). The largest number for an extended length of time was 20 (Yes, it got pretty crowded and there weren't many hot showers, but they were real troopers). Many of the taxi drivers in the area refer to my house as the "International House" due to the number of kids who come there. My goal has always been to make my house the type of comfortable place for these kids as I would hope my daughter would have stayed in had she decided to march with another corps. At least some of the new members get to know a few of the other members and aren't dealing with a group of total strangers when going to rehearsals. What is the most difficult part of being a volunteer? Having my time to spend with the corps reduced due to my present job. I would love to be able to spend more time with the corps while on tour (I can sleep on the bus in the seat, on the floor, on the arm rest. You name it, I've done it and enjoyed it.). My hope is that at some future time I will be able to work at the Blue Devil office dealing with everything related to the members and the parents and still be able to go on tour. Favorite memories or anecdotes: Spending so many years with the corps and with many of these years with Jerry Seawright as manager, there are hundreds of wonderful memories and funny happenings, far too many to list individually and some we really don't want to repeat. It still brings a laugh recalling that just as they started a presentation of an award for me at finals one year it started to rain, and it not only rained, it poured! I got a bad case of the giggles and got totally soaked. During my 15 minutes of fame it rained on my parade! Special times: Watching my daughter, Deana, performing and being able to be on tour during her ageout year in 1988. It was a special year when both my daughters and I were with the corps: Deana as a performer and Diane acting as assistant to then director Mike Moxley. Not so special times: Having to say goodbye after finals. Dealing with the tears, the feeling that your heart is going to break and the conflicting emotions of immense pride, joy and sorrow. Many of my favorite memories have to do with times I have been able to meet and interact with the parents of members I have grown close to (which are any I come in contact with. It's a habit of mine) and all the fun and laughter that went on at "Hotel Williams." What are you most looking forward to during the 2006 season? We are all anticipating what our talented and creative staff will come up with for "The Godfather Part Blue" for 2006. The corps members are excited about the show and have shown unbelievable talent in the way they are performing the music. Therefore, we just know it is going to be a great year. We can't wait to see what Scott Chandler and his staff come up with for the color guard. When our members finish a year knowing they have done their best, it is always a great year. I have no reason to think 2006 will be any different. Advice for those who would like to get involved as a volunteer: Do it! Jump in feet first without hesitation and get ready to spend some of the most satisfying and best times of your life. The sense of pride you get watching these young people mature into some fabulous young adults cannot be measured. As I am sure it is with any corps, there is so much genuine love to give and to get. Believe me, you will receive far more than you give. I, personally, appreciate the fact that I have been privileged to have the opportunity to get to know many young people (and parents) over these years. There are really wonderful people in this world, and being part of the Blue Devils has provided me the chance to meet a great number of them. I wouldn't trade the experience for anything! Add anything else: I would like to express my sincere appreciation and love to all my Blue Devil sons and daughters for giving me so many wonderful memories that will stay with me forever! It's been my pleasure. Don't forget to stay in touch with "Mom."